The English makers are especially appreciated for their cellos. 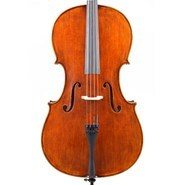 This fine old English cello has an amazing full, rich tone with easy playability. All Jay Haide cellos are hand-made of quality seasoned maple and spruce and have a tone quality and workmanship normally found in instruments costing much more. Jay Haide cellos are now available in five models. The Model J.H. and 101 are excellent choices for beginning or intermediate players. The Model 104 and á l'ancienne are made by more senior violin makers with finer quality aged wood for musicians requiring the best tone quality. The Jay Haide á l'ancienne cellos are brought to you after years of development. The varnish is a new formulation, carefully applied and beautifully antiqued giving each instrument the patina of age, so desired by both musicians and connoisseurs. They are as beautiful tonally as they are visually. The Jay Haide á l'ancienne has been designed for the advanced student and professional who needs an instrument that will compliment and enhance their artistic style.. We are currently offering the ancieene model in Strad, Montagnana, and Ruggeri patterns. Jay Haide, Model 104. These fully handmade cellos represent an excellent value for a promising student. 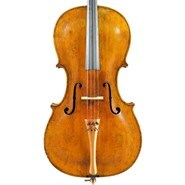 We usually have a good selection of these cellos, priced from $3,650. All Jay Haide cellos are hand-made of quality seasoned maple and spruce and have a tone quality and workmanship normally found in instruments costing much more. Jay Haide cellos are now available in five models. The Model 104 and á l'ancienne are made by more senior violin makers with finer quality aged wood for musicians requiring the best tone quality. Jay Haide, Model 101. These fully handmade cellos represent an excellent value for a promising student. We usually have a good selection of these cellos, priced from $2,850. All Jay Haide cellos are hand-made of quality seasoned maple and spruce and have a tone quality and workmanship normally found in instruments costing much more. Carlos started his violin making career in his native Argenina before going to the violin making school in Milan. In Cremona he has worked with a number of masters. Jay Ifshin especially chose this excellent cello from our latest Cremona exhibition. Coratti began violin making in 1962 and went on to work with Morassi in Cremona. By the early 1970’s he was already winning awards and medals at major competitions including first prize at the Poznan “H. Wieniawski” competition in 1981. and two silver medals at the Cremona Triennial competition in 1979. Jim McKean started his violin making career at the Violin Making School of America in 1973 in its very first class. After graduation in ’77, he moved to New York and worked with V. Nigogosian whose shop was a destination for the best makers at that time. He opened his own shop in Manhattan in 1981 and his instruments soon were in demand. Respected by his peers, Jim is past president of the American Federation of Violin and Bow makers. His instruments are performed on by professional musicians and soloists, including Carter Brey (Principal Cellist, New York Philharmonic) and Andreas Cardenas. Over the years, we have offered several fine instruments by Alessandro Ciciliati. A trained bass player, he makes and restores instruments in Ferrara together with his brother, Roberto. He is noted for exceptionally fine workmanship and tone of his instruments. Both René (father) and Marcel (son) worked together both in Brussels and later on in Los Angeles. This is an excellent cello, typical of their work with a full, warm tone. Max Franke worked for a number of important makers including Otto Jaeger, H. Kessler, R. Heberlein and A. Wilfer in Leipzig before opening his own shop in 1921. Now in its third generation of violin makers, The Vettori family has become famous for the superb quality of their instruments and are the most prominent makers in Tuscany. Dario II studied with his father Paolo and has had great success as a maker. He is also a professional cellist. Giancarlo began violin making at a very early age and studied with Enrico Piretti. He won awards for his cellos at a major competition in Ascoli Piceno.